40 metres / 130 feet to over 60 metres / 200 feet. 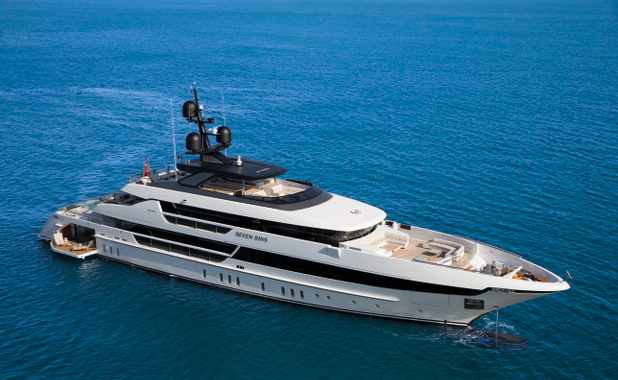 To date, Sanlorenzo Superyacht Division has delivered something approaching two dozen metal super yachts and now, just one year since it moved to the new shipyard in La Spezia, there are eight different super yachts simultaneously in different stages of production at the yard’s facilities there. 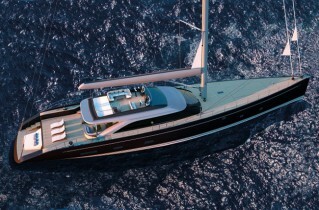 Confirming the major international success achieved by the Italian shipyard in the super yacht sector, these include a Sanlorenzo 64 Steel and a Sanlorenzo 40 Alloy, as well as three Sanlorenzo 460 Explorer vessels and three Sanlorenzo 52 Steel vessels. 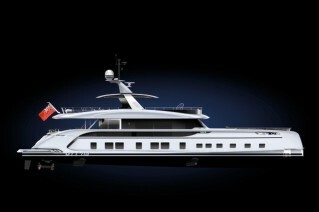 As for the Sanlorenzo 52 Steel super yacht line, the first hull took to the water in January this year at the La Spezia yard. Known until that moment only as “Sanlorenzo Build No. 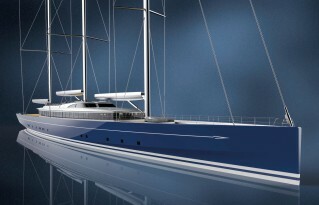 123”, during the launch ceremony the yacht was named Seven Sins by her Belgian Owner. 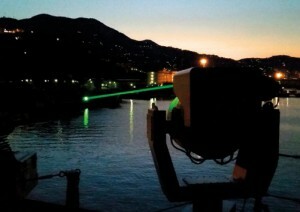 The presentation of Seven Sins at the quayside in Port Hercules in the prestigious setting of this year’s Monaco Yacht Show marks the high society debut of the new super yacht, which, to the delight of a small number of lucky expert connoisseurs, is available for charter use with professional management provided by the Owner’s company of choice, specialists YPI Yachting Partners International. 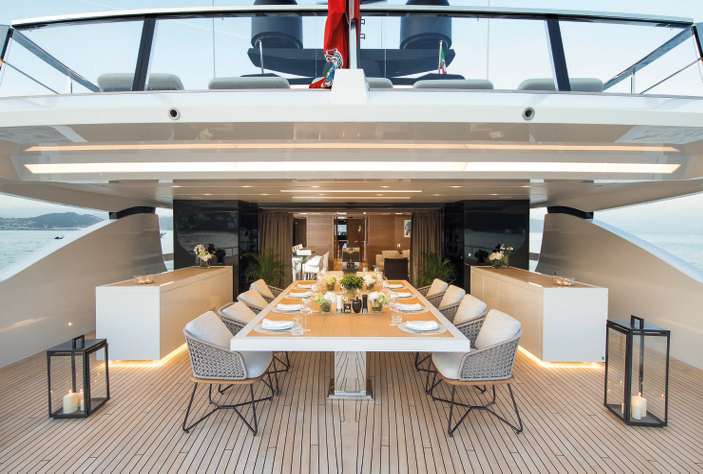 In creating the new Seven Sins, Sanlorenzo Superyacht Division developed both the naval architecture and marine engineering in-house, and worked closely with Italian designers Officina Italiana Design to create both the exterior and interior design. In the aesthetic elegance of her modern yet timeless external shapes, Seven Sins also expresses the luxurious perfection of her interiors, whose exclusive, contemporary style is characterised by soothing materials and the distinctive, sophisticated refinement of the details, thrown into sharp relief by the abundance of natural light flowing in through the floor-to-ceiling windows. 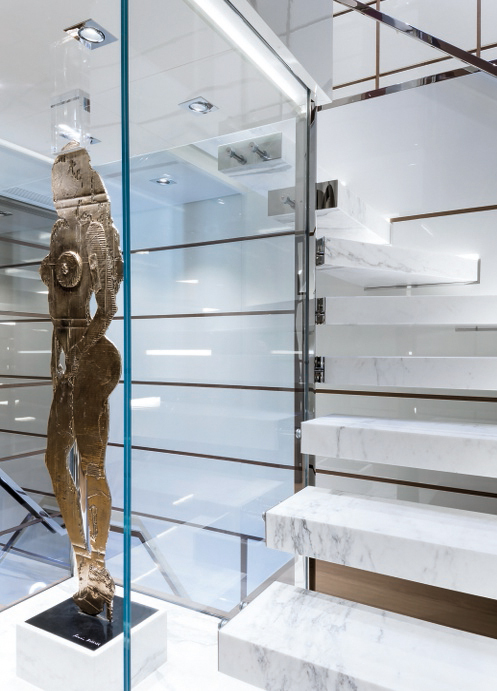 Among the countless highlights of the decor on Seven Sins, perhaps the one that best represents the sense of this design concept is the sensational lobby amidships on the main deck, where a spectacular sculptural staircase in Carrara marble houses and frames an exquisite glittering crystal display case, designed to display an artwork specially selected from the Owner’s private collection. 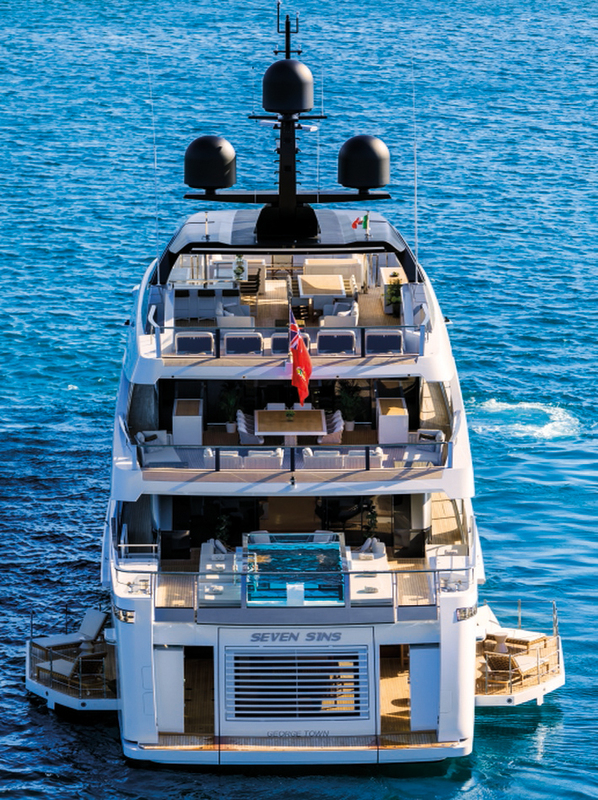 This unique, exclusive solution created for Seven Sins also bears spectacular witness to the design philosophy that Sanlorenzo has always applied to every yacht it has built, respecting the individual personality of each owner with the aim of flawlessly fulfilling their wishes and needs. 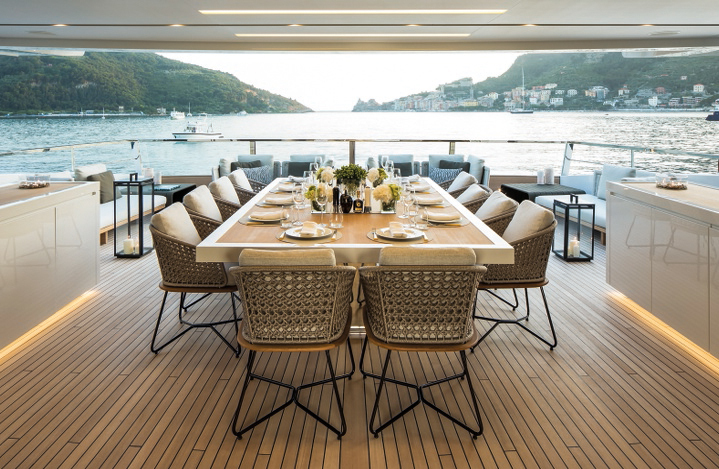 Together with the decorative fittings and furnishings, the various spaces and environments on board Seven Sins constitute something genuinely exceptional, for example the extraordinary beach club which is an authentic salon on the water. 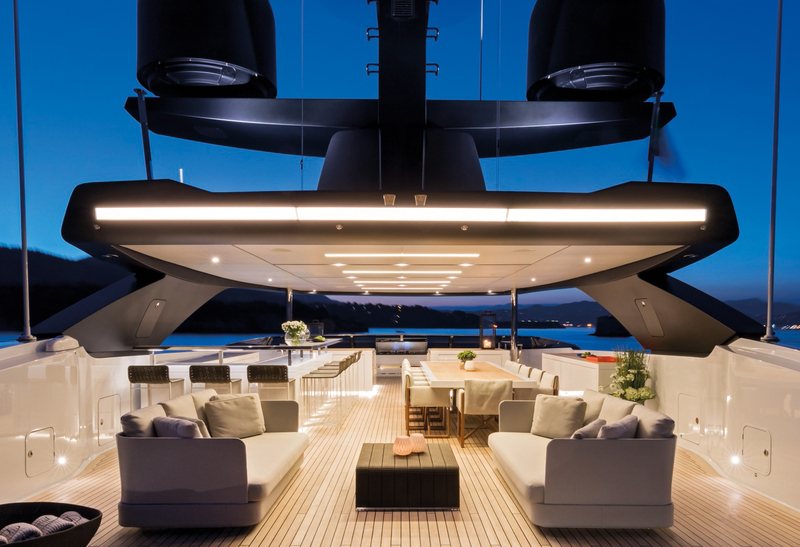 This has been created thanks to a surprising metamorphosis of the whole stern area of the lower deck, made possible due to a miracle of engineering developed entirely in-house by the Sanlorenzo Superyacht Division Technical Office. The entire transformation procedure can only be described as a spectacular achievement, both in general and for its type, and indicates a certain kind of cinematographic inspiration, with many points in common with transformer vehicles. 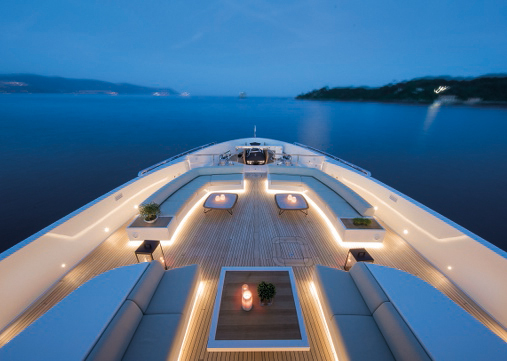 However, this super yacht is certainly not a utopian fiction but rather an intelligent dream that has become a tangible reality. 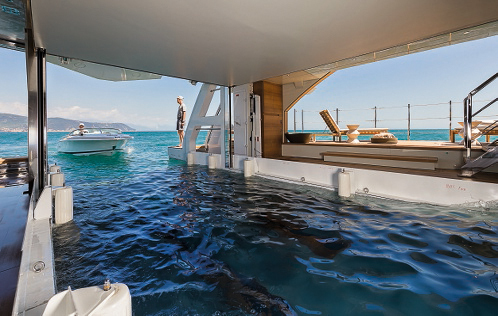 The starting point is the transom hatch, which lifts open so that the garage can be flooded to allow the main tender to float out of the yacht. 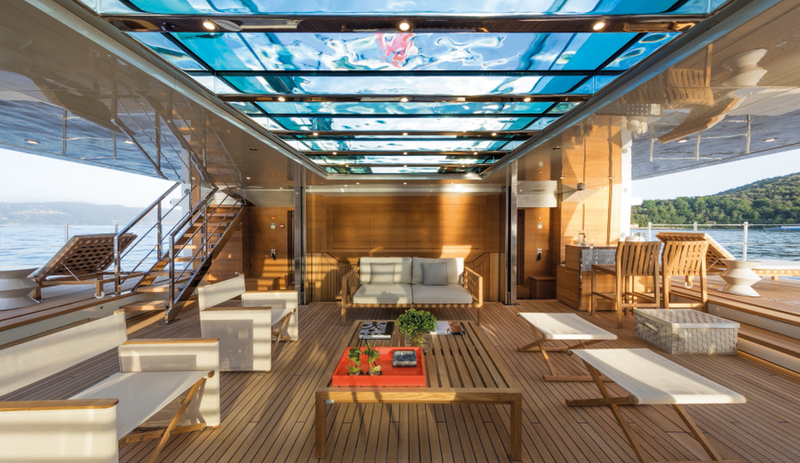 Then the hatches in the sides fold out to form a pair of terraces overhanging the sea, while a large panel descends from the ceiling at the same time to close off the space left by the main tender and join with the teak floor, simultaneously revealing the transparent glass base of the swimming pool above. The theatrical final touch comes when the beach club salon is bathed in a cascade of sunlight, which creates shimmering effects as the light passes through the water and glass of the pool. 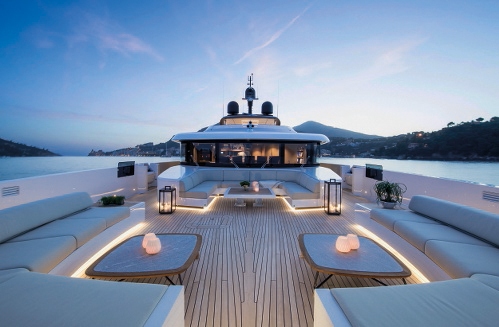 In addition to this extraordinary beach club area that also offers a lounge area with bar and a fitness and wellness area with a gym, a sauna and a hammam, Seven Sins can also boast numerous other areas where the Owner and guests can socialise in during cruises. These include the immense sun deck, which offers an incomparable panoramic 360-degree view to the horizon. 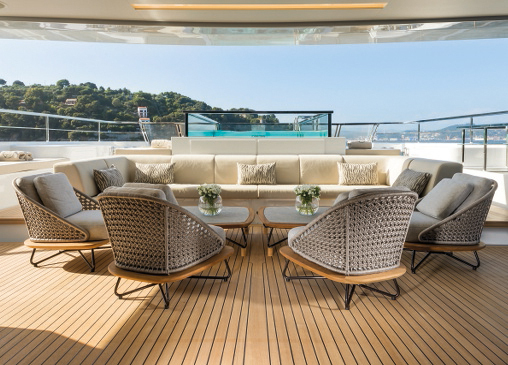 Its huge surface is home to an enormous sunbathing area and two large open-air lounges, as well as an alfresco dining area and a bar, both protected by a very large hard top. 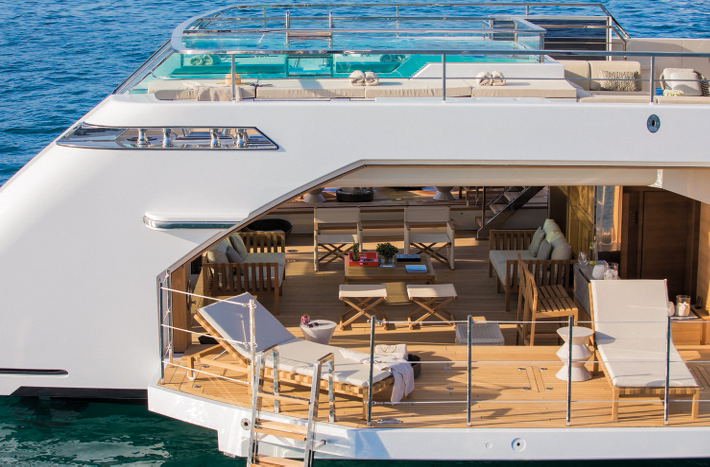 Outside on the upper deck there is also a very large open air lounge forward and to aft a secluded alfresco dining area is protected by the overhanging deck above. Meanwhile, inside, the upper salon has a comfortable dining area and a welcoming living area, separated by a low-profile unit that houses the disappearing TV screen. 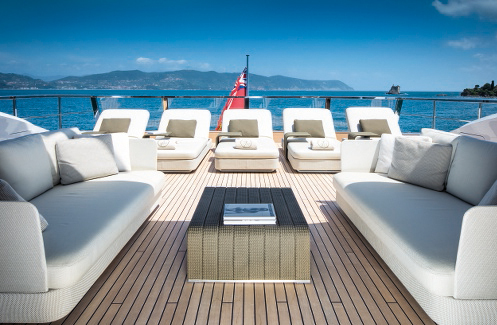 Abundant space is provided outside on the main deck by a sunbathing area and the swimming pool. 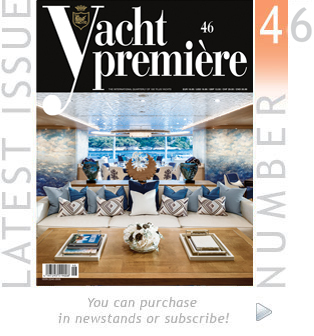 These also increase the level of privacy when moored in port, protecting both the wheelhouse lounge and the main salon entrance area with its walk-through bar from curious glances. 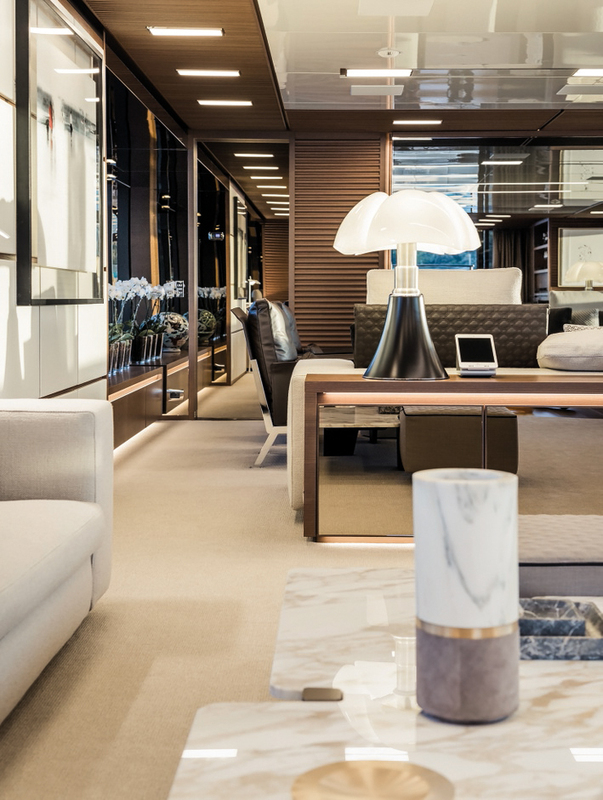 Inside, the main salon has been designed as a magnificent, light-filled open space subdivided into two different lounge areas – one more formal, one more casual – by several carefully placed low-profile units. However, obviously in addition to the socialising areas, the demanding Owner very recognisably made his mark in the areas reserved for private life as well. 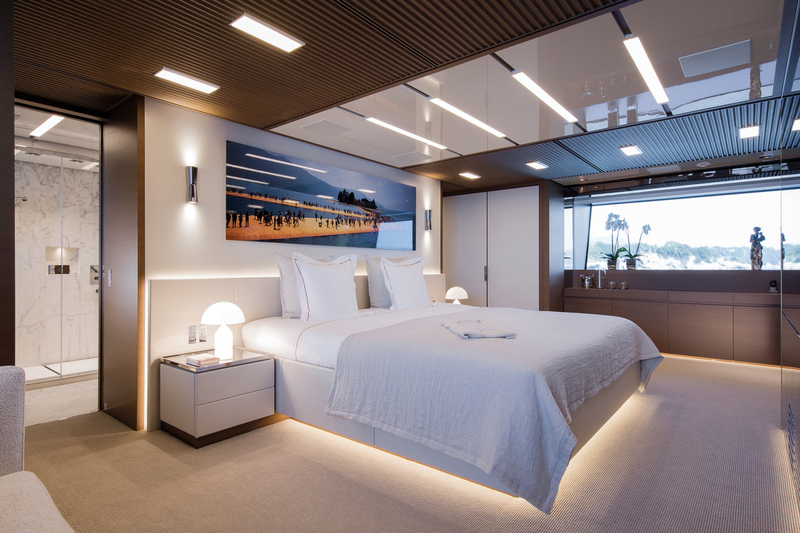 In addition to the majestic Owner’s suite on the main deck with a private office and a full-beam master stateroom, the private accommodation features two VIP staterooms and two guest staterooms on the lower deck amidships, which are undeniably unrivalled in terms of space and comfort. 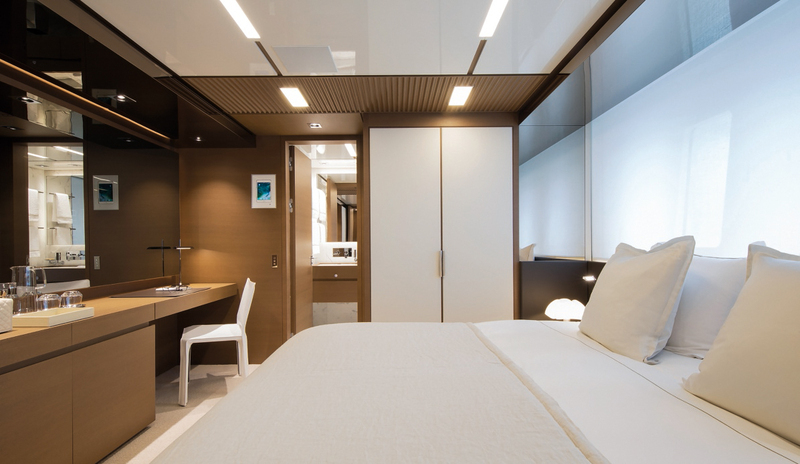 Both the Owner and guests aboard Seven Sins will enjoy an impeccable level of service provided by the crew with the utmost discretion thanks to a layout specially designed to allow operational activities and service tasks to be completed in such a way as to avoid unnecessary interaction between the guests and the on-board staff. 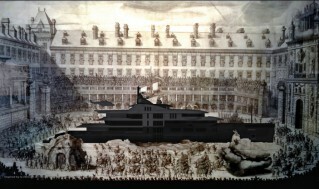 The crew quarters on Seven Sins include an engineer’s cabin and three crew cabins on the lower deck. 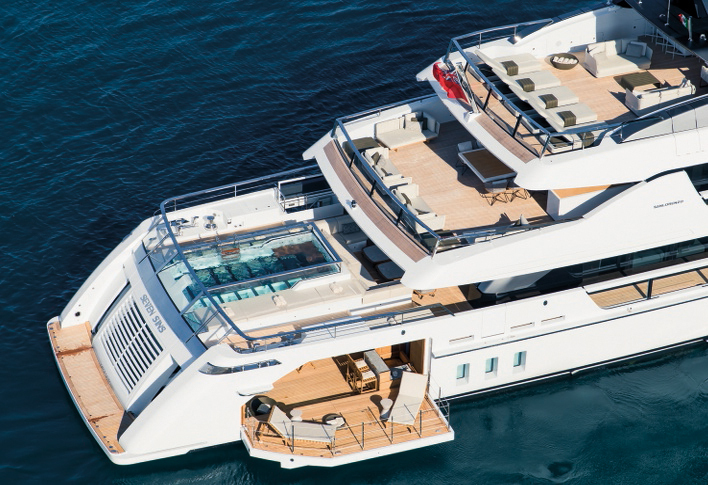 The captain’s cabin is of course on the upper deck, along with an additional staff cabin with a fold-out bed to provide a versatile space that can fulfil different functions at need.